Here's my appearance on Rogers TV's Daytime, hosted by Derick Fage and Lois Lee (photo above by Reid DeLong). Thanks to Sean Augstman, the director, and to my friend Paul Donnelly, who taped it for me. 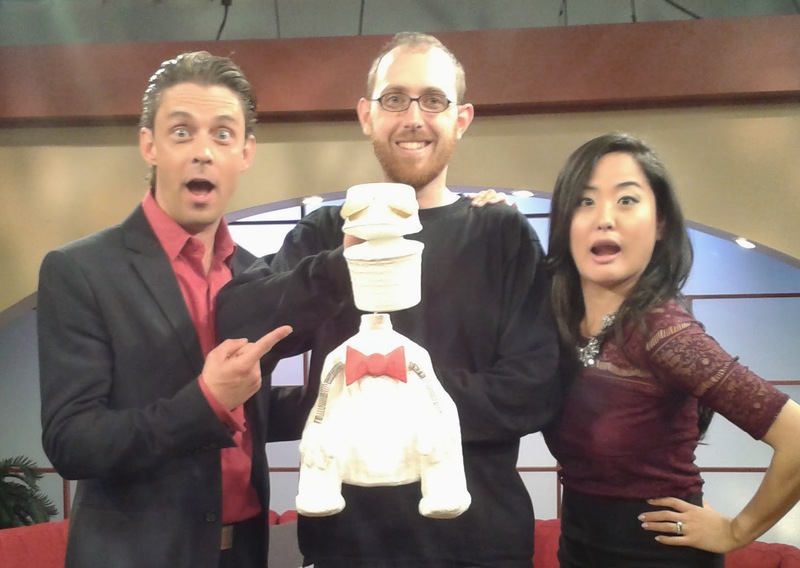 This Wednesday, October 9, I'm going to be appearing (with a puppet) on Daytime, the community events show on Rogers TV (cable 22) in Ottawa. I'm usually a volunteer on this show (it's crewed mostly by volunteers), but this week I'll be in front of the camera, performing a skit I developed at Animotion. The show is usually broadcast live from 11 AM til noon, but it might be preempted by coverage of the City Council meeting. It's always repeated, though, at 2 PM, 5 PM, and 11 PM. I'll share the video on here if I can, but may not be able to for convoluted copyright reasons. So if you live in Ottawa, check it out! Here's a video of my previous appearance on Daytime.